Huskies Extraordinaire of Cafitachiqui participates in rescue efforts and works to find homes for abandoned or neglected Siberian Huskies. 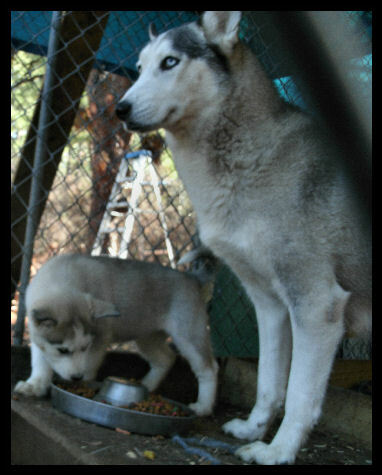 The above photos represent a rescue of some Siberian Huskies around 2010 in Orangeburg, SC. The ones pictured were sent to the Maude Shiffley SPCA Animal Shelter there located at 225 Ruf Rd., Orangeburg, SC. You may contact them for adoption information of rescues they may have. You can also fill out our contact form on this website. Just look in the navigation bar above and click on Contact Us to go to the page. Once you fill out the form, please remember to click Submit to send your information to us. Chilalli and Denalli - our most recent sibes available for adoption. Both of these females are gorgeous and very loveable. 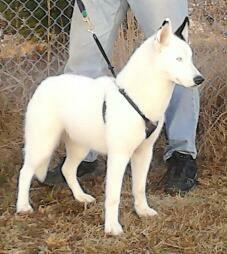 Our white piebald girl Lalli is playful but then again at a year old she is still a puppy. 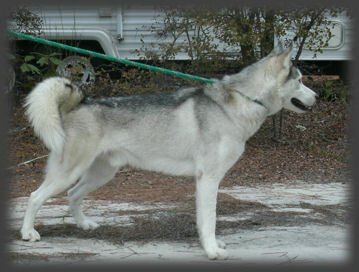 Denalli, a gray and white, is very settled and mature. These regal canines need active homes and companions. Please contact us if you are interested in either of these females. Both are very healthy. This handsome silver boy Legend who came to us from Lexington County, SC as a neighborhood stray was sent to a loving home in the mountains of Asheville, North Carolina and now has plenty of room to safely roam. Our rescues are lovingly placed. Update!!! Legend has been placed in a wonderful home in NC. This beautiful silver gray and white male pictured at left is our newest rescue. 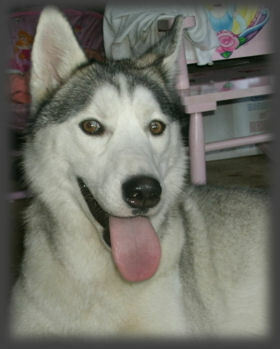 He is a happy, docile and equally playfull male who needs a special loving home. Adoption for this young male is 175.00 just to cover his care, wormings and vaccinations. We just received this male at Cafitachiqui so we would like some time to make sure he is within his proper weight range and make sure he is in good health before we place him. However, we are screening potential adoptees at this time. We are calling him Legend. 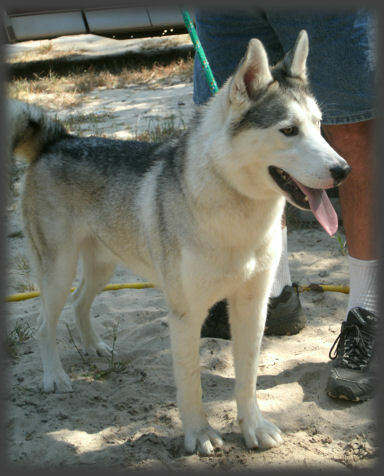 This beautiful sibe, who we estimate to be about one year old, has been neutered. Chilalli was recently placed in a wonderful loving home in South Carolina with children to run and play with her. She will be missed but will be happy and well loved in her knew home. 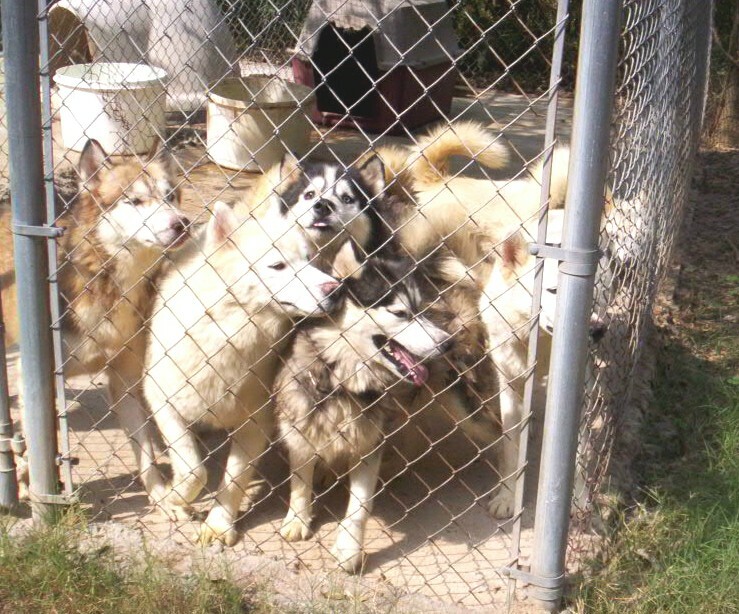 We support and urge you to support the Howlmore Animal Sanctuary. Founded by Linda Moore and Hayden Howell in 2008, this local sanctuary is a well kept, safe haven in South Carolina for various animals in need. "The sanctuary provides a home for animals that for whatever reason are not easily adoptable. The special needs of many of our residents may be a major obstacle to finding them a new home. 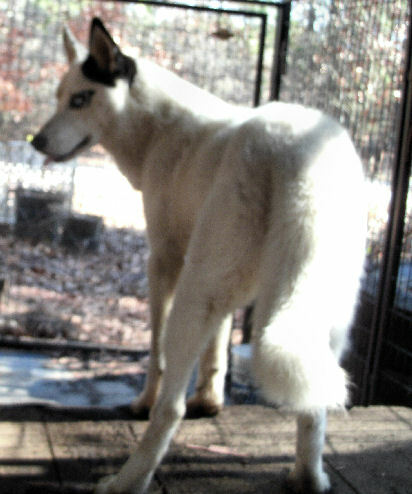 But at Howlmore, they find a secure environment where they rehabilitate and are adopted into "forever" homes or simply live out the rest of their lives in peace (excerpt from website page of Howlmore Animal Sanctuary)."